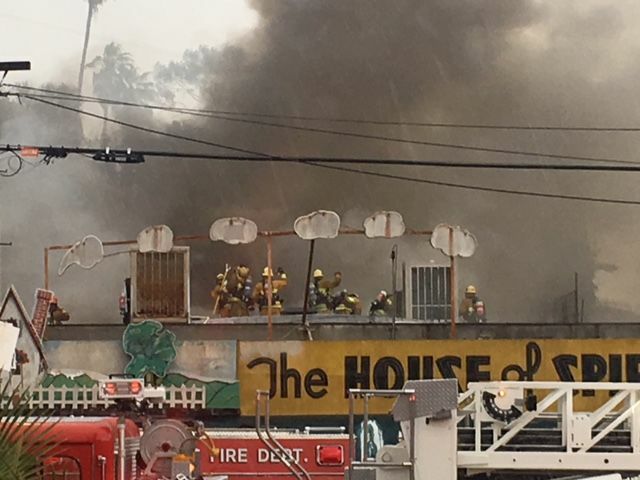 Echo Park — Firefighters battled a fire that broke out this morning in the House of Spirits liquor store during a heavy rain, according to the L.A. Fire Department. It took 77 firefighters an hour and 15 minutes to fully extinguish the blaze that was reported at 9:46 am. There are no reports of injuries, and the blaze did not spread to adjacent apartment bungalows and commercial buildings in the 1300 block of Echo Park Avenue near Montana Street. The cause of the fire has yet to be determined, said LAFD. The blaze in the rear of the building threatened to send a roof-top air conditioning unit falling into the one-story structure. That forced firefighters into a defensive position in the front of the store where they poured “heavy streams to extinguish the flames,” said the LAFD on Twitter. Photos and video of the fire show it burning behind the store’s iconic neon sign, which depicts puffs of smoke emerging from the chimney of a small home. The sign did not appear to be damaged. 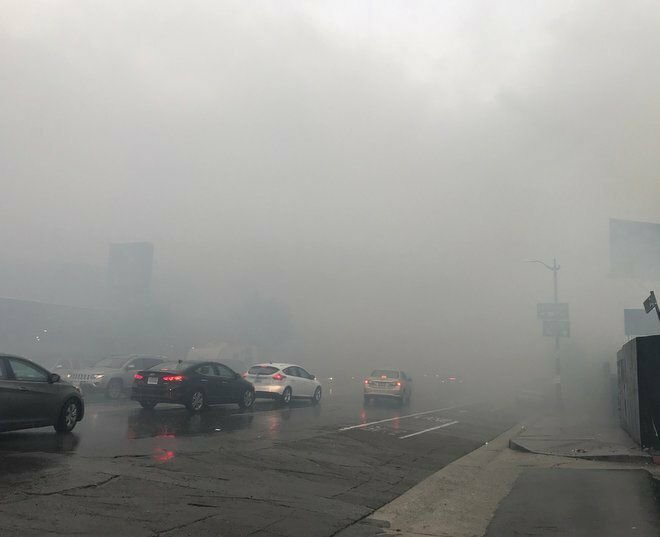 Photos from Mary-Austin Klein show that heavy smoke billowed across nearby Sunset Boulevard. Echo Park Avenue at Montana has been blocked to traffic. Meanwhile, several Twitter users reported that power went out in some parts of the neighborhood as the fire burned. It’s not clear if the two issues are related. @LADWP power out in Echo Park. When will it be back up? Berkeley Avenue near Glendale Blvd. Power out in #echopark, at least between Alvarado/sunset to Echo park Ave/sunset. All stores, traffic lights are dark. Creepy!